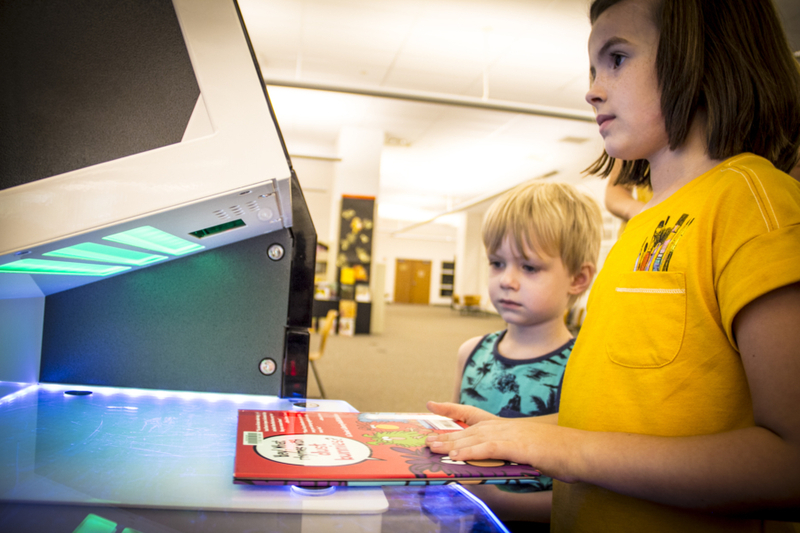 The library purchased three self-check machines, two for the first floor and one for the second floor, as an alternate to the checkout at the circulation counters. There are two check in machines, one outside of the library near the entrance and one in the lobby. Touch the screen for "Check Out". Scan your Patron ID, 14-digit barcode under the red laser line. OR choose to enter the # manually. Once the system has accessed your account, place all items on the table beneath the green light. Watch them be checked out automatically upon the screen. Let them sit on the pad for several seconds to ensure they are desensitized. We wouldn't want the gate alarms to go off. When done, choose to print or email receipt - it shows all of the items checked out and when they are due. At the exterior machine only, first push the silver circular button. If the light is showing green, place one book at a time on the table. The book will be pulled and and the light will turn red. Once the changes from red back to green, another book can be checked in. After all books have been returned, push the "???" button on the screen. Radio Frequency Identification Radio (RFID) frequency communication is used to track physical items through a uniquely identifiable tag containing an internal computer chip and antenna to store and transmit data. Library RFID systems are composed of two primary components: tags and tag readers. The tags are placed inside library materials. The readers are placed at staff workstations, self-check machines, and built into security gates. The readers are used to read the information on the tag such as an item’s barcode number. The readers are used much like barcode scanners are used: to check items in and out, put items in transit to fill holds, and to verify that items have been properly checked out at each library exit. The key difference between barcode scanners and RFID readers is that RFID readers are not optical and so do not require “line-of-sight” scanning of the barcode. RFID also allows for multiple items to be read at once, and for security to be managed simultaneously as check-in or checkout.